He lived in the shadow of kings. One trusted him with his empire; the other feared his every move. Memnon of Rhodes (375-333 BC) walked in the footsteps of giants. As a soldier, sailor, statesman and general, he was, in the words of Diodorus of Sicily, "outstanding in courage and strategic grasp." A contemporary of Demosthenes and Aristotle, Memnon rose from humble origins to command the whole of western Asia in a time of strife and slaughter. To his own people, he was a traitor, to his rivals, a mercenary. But, to the King of Kings, his majesty Darius III of Persia, Memnon was the one man capable of defending Asia Minor from the rising power of the barbaric Macedonians. 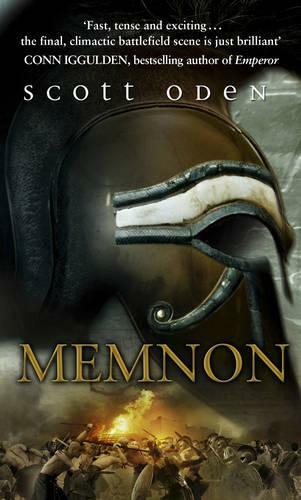 In a war pitting Greek against Greek, Memnon proved his quality beyond measure. His enemies fought for glory and gold; Memnon fought for something more: for loyalty, for honour, and for duty. He fought for the love of Barsine, a woman of remarkable beauty and grace, but most of all, he fought for the promise of peace. Through the deathbed recollections of a mysterious woman, the life of Memnon unfolds with brilliant clarity. It is a record of his triumphs and tragedies, his loves and losses, and of the determination that drove him to stand against the most renowned figure of the ancient world - an ambitious and brilliant young conqueror called Alexander the Great. what can i say, a fantastic book from start to finish !!!!!! !